G-protein, with GDP in purple. Two sites of lipidation are not included in the structure, and are modeled here at upper right. Cells communicate by passing small, disposable messages to one another. Some of these messengers travel to distant parts of the body through the blood, others simply diffuse over to a neighboring cell. Then, another cell picks the message up and reads it. Thousands of these messages are used in the human body. Some familiar examples include adrenaline, which controls the level of excitement, glucagon, which carries messages about blood sugar levels, histamine, which signals tissue damage, and dopamine, which relays messages in the nervous system. In many cases, these molecular messengers never get inside cells. Instead, the message is picked up by a receptor on the cell surface and the signal is then passed from outside to inside through a chain of signaling molecules. G proteins, such as the one shown here from PDB entry 1gg2 , form the central link in this chain of communication. The G protein system is the most common method of signaling in our cells. Thousands of G-protein-coupled receptors have been found on our cells, each waiting for its own particular messenger. Some, such as the glucagon receptor, recognize hormones and make changes in the level of metabolism. Others, such as the adrenergic receptor, are used in the nervous system to transmit nerve signals. Our sense of sight also relies on rhodoposin, a G-protein-linked receptor that is sensitive to light, and a thousand different forms of these receptors, each recognizing the odor of a different molecule, control our sense of smell. They all share the combination of a receptor that receives a message and a G protein that delivers it inside the cell. G proteins are molecular switches that use GDP (colored purple here) to control their signaling cycle. When GDP is bound, as shown here, the G protein is inactive. To activate the protein, the GDP is replaced with GTP, the G protein will deliver its signal, as shown on the next page. G proteins come in many shapes and sizes. Most are used for cell signaling, but other types play an important role in other tasks, such as powering protein synthesis. The ones described here are termed heterotrimeric G proteins because they are composed of three different chains, denoted as alpha (tan), beta (blue), and gamma (green). The little red piece is a loop on the surface of the alpha subunit that is important in transmitting the signal. These G proteins bind to the inner surface of the cell membrane, holding them close to their receptors. Several small lipids are attached to the protein chains (as seen at the upper right in the picture), which insert into the membrane and tether the protein there. However, don't try to find these little lipids in the crystal structure file, because they were removed to allow crystallization. The G protein system plays a central role in many signaling tasks, making it a sensitive target for drugs and toxins. Many of the drugs that are currently on the market, such as Claritin and Prozac, as well as a number of drugs of abuse, such as heroin, cocaine and marijuana, act at G-protein-coupled receptors in these signaling chains. Cholera bacteria make a toxin that attacks G proteins directly, by attaching a nucleoside group in a strategic place. This modification causes the G protein to be continually active. Among other things, this disrupts the normal controls on fluid balance in intestinal cells, and the infected person rapidly becomes dehydrated as water, sodium and chloride are lost. Signaling with G-proteins. Portions of the molecules that are not included in the structures are shown schematically. G proteins relay their signal on the inside surface of the cell membrane. The process starts when a receptor binds to its proper hormone or neurotransmitter, such as adrenaline. This changes the shape of the receptor, and it binds to the inactive three-chain G protein inside. This causes the G protein to expel its GDP molecule and replace it with GTP. The GTP causes a small loop (shown here in red) to change shape, and the G protein falls into two pieces. 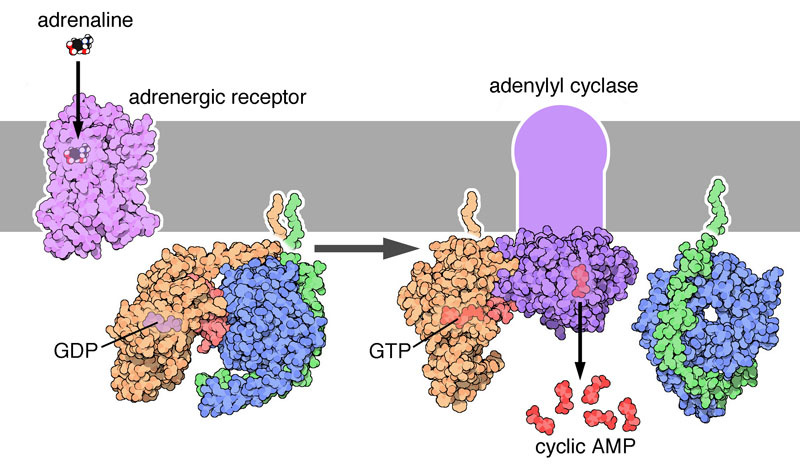 The freed alpha subunit, with its bound GTP, then moves along the membrane until it finds the enzyme adenylyl cyclase. The little loop then binds to the enzyme and activates it. The activated adenylyl cyclase then produces lots of cyclic AMP, which spreads the signal through the cell. Eventually, the GTP in the active alpha subunit will break down into GDP, and the G protein will reform into its inactive, resting state. One major advantage of this approach is that it allows the signal to be amplified. In the signaling chain shown here, a single molecule of adrenaline can stimulate the production of many molecules of cyclic AMP. By incorporating an enzyme (like adenylyl cyclase) into the chain, a weak signal from outside the cell can be translated into a strong signal throughout the inside of the cell. When you go to look at these structures yourself, keep this in mind: structures are available at each stage of this interesting process, but you have to be willing to cobble together examples from a number of different signaling pathways. Four PDB structures were used in this picture: 2rh1 , 1got , 1cul , and 1tbg , from left to right. G proteins use GTP to switch to their active state. In the active form, shown on the right from PDB entry 1gia , the last phosphate group in GTP contacts a short loop on the surface of the protein, holding it tightly against the surface. The GTP is shown with spheres, and the loop is colored red. When GTP is cleaved into GDP, however, this phosphate group is removed, and the shorter GDP molecule cannot contact the loop. This allows a looser structure in the loop, which is recognized in the inactive trimeric complex, as shown on the left in PDB entry 1gg2 . Also, be sure to spend some time looking at the beta subunit, for instance, in PDB entries 1gg2 , 1got or 1tbg . If you draw a chain trace or a ribbon diagram, you will see that the chain folds into a beautiful propeller-shaped structure. These illustrations were created with RasMol. You can create similar pictures by clicking on the accession codes and picking one of the options for 3D viewing. S. R. Sprang (1997) G protein mechanisms: insights from structural analysis. Annual Review of Biochemistry 66, 639-678. H. R. Bourne (1997) How receptors talk to trimeric G proteins. Current Opinion in Cell Biology 9, 134-142. D. E. Coleman and S. R. Sprang (1996) How G proteins work. Trends in Biochemical Sciences 21, 41-44. J. R. Hepler and A. G. Gilman (1992) G proteins. Trends in Biochemical Sciences 17, 383-387. M. E. Linder and A. G. Gilman (1992) G proteins. Scientific American 267(1), 56-65.